NAPWHA and the WAAC, have committed to supporting two WA Community Forums per year. One to be conducted in March, before the NAPWHA S.G.M (April), and the second to be conducted in September before the NAPWHA A.G.M. (November). 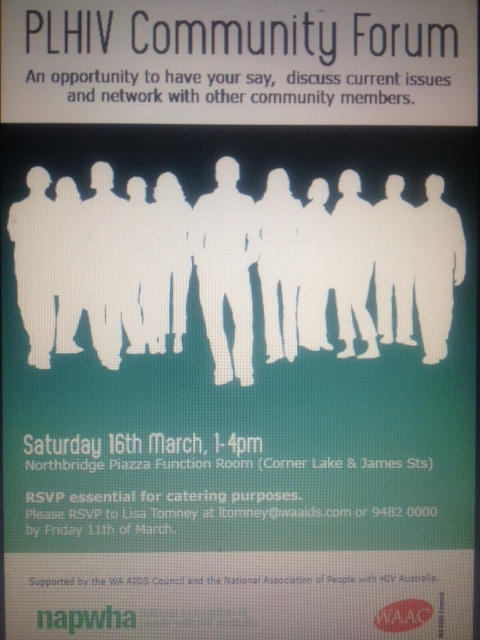 The general purpose of these meeting is to discuss current issues relevant to people living with HIV in W.A. This Forum was facilitated by Ash and Dianne (WA NAPWHA Reps). 16 people RSVP’d for the event, however only 10 were able to attend on the day. Thank you to NAPWHA for the catering and venue, and thanks also to WAAC for promoting the event through its internal contact list. Important progress included the setting up of a ‘HIV Caucus’ to co-ordinate advocacy efforts for changes to the WAAC constitution so that PLHIV or members of WAAC can directly vote on who is the openly HIV Positive representative of the community on the WAAC Board (currently it is politically appointed by the Board). Another important issue was easy access to HIV medication in a community setting. I would like to place this on the agenda for the next Positive Community Forum. The Position and role of the Positive Representative on the Aids Council Board. to changing the role or how it is elected. and Local and State issue could be dealt with as well as the national issue. Board it would be in there best interested too. your Support officer the CEO or Chairperson and lobby for this . I Have written to the Board see below . If we do not speak out as a community  for this change nothing will happen . now time for some action on this issue from the POZ Community is taken. or your own...the more that speak out about this stronger the call for change .